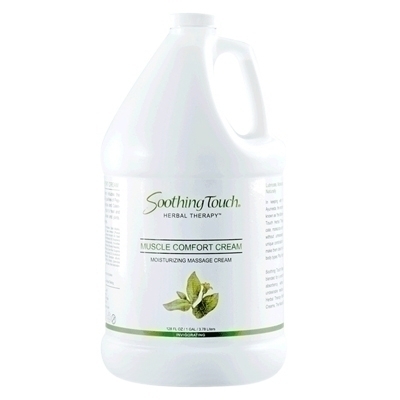 Muscle Comfort Cream, Pumpable, 1 Gallon: Ease deep-rooted tension using Soothing Touch Muscle Comfort Cream. Ideal for deep tissue work and easing muscle tension, this rich cream is formulated to energize the body and mind. Infused with the healing elements of Eucalyptus, Peppermint, Clove, Arnica and Ginger for a rejuvenating treatment. Muscle Comfort Cream has a very subtle peppermint scent and a smooth glide to help you break through surface tension allowing for a deeper massage.